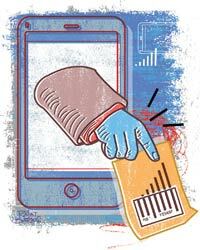 The government hopes to untangle the spectrum imbroglio with its new telecom policy. Telecom Minister Kapil Sibal has announced a new National Telecom Policy that de-links 2G spectrum allocation from telecom licences. So far spectrum has been offered free with licences. The policy will make the government coffers swell as it mandates that old operators such as Bharti Airtel, Vodafone Essar and Idea will pay market-driven prices for spectrum usage beyond 6.2 mega hertz (MHz). In addition, new operators such as Uninor, MTS, Videocon and Etisalat, which were given licences in the 2008 auction, will have to pay for using spectrum beyond 4.4 MHz - if their licences are held valid. After the current licence lapses for telcos, they will have to renew it by paying separately for licence and spectrum. The 2G licence of many operators, including Bharti Airtel and Vodafone, will expire between 2014 and 2021. Under the earlier guidelines, the operators had paid Rs 1,658 crore (the price was discovered through an auction held in 2001) to get licences in 22 circles of the country, along with 4.4 MHz of spectrum free. According to the draft recommendations of the Telecom Regulatory Authority of India, or TRAI, the government can collect over Rs 90,000 crore by allotting additional 1.8 MHz of 2G spectrum to six new operators with pan-India operations. But TRAI's formula for the price in each circle is yet to come. "I don't think TRAI will fix the prices on the basis of 3G prices. 3G spectrum is three times more efficient than 2G and the two can't be put in the same category," says Bhavesh Gandhi, telecom analyst at India Infoline. Last year, the Comptroller and Auditor General of India, or CAG, accused the telecom ministry of selling spectrum in 2008 at unrealistic prices, which has caused a notional revenue loss of Rs 1.76 lakh crore to the exchequer. The new policy is expected to push up tariffs for customers. "The financials of major players are stretched at the moment. The tariffs have gone down significantly, which has resulted in EBITDA margins of old operators going down from 40 per cent two years ago to less than 30 per cent now. And they may pass on this burden to the customers," says Gaurav Dixit, analyst at rating agency Care Ratings. The government, though, is expected to safeguard the interests of the operators as well. "One way could be to allow old operators to share spectrum (where it is not fully used) with other players which can bring them more revenues," says Dixit. Also, the government has indicated a reduction in the revenue sharing fee. This will benefit the big operators. Some analysts expect the government to evolve a policy to encourage mergers and acquisitions, which will result in consolidation and healthy competition. Large markets such as the US, Japan and Brazil have four to five operators at the most. India, on the other hand, has 15.